ROCHESTER, Minn. — Damage to DNA is a daily occurrence but one that human cells have evolved to manage. Now, in a new paper published in Nature Structural & Molecular Biology, Mayo researchers have determined how one DNA repair protein gets to the site of DNA damage. The authors say they hope this discovery research will help identify new therapies for ovarian cancer. While the human genome is constantly damaged, cells have proteins that detect and repair the damage. One of those proteins is called 53BP1. It is involved in the repair of DNA when both strands break. In the publication, Georges Mer, Ph.D., a Mayo Clinic structural biologist, and his team report on how 53BP1 relocates to chromosomes to do its job. Dr. Mer explains that, in the absence of DNA damage, 53BP1 is inactive ─ blocked by a protein called "TIRR." Using a visualization technique called X-ray crystallography, the authors show that TIRR obstructs an area on 53BP1 that 53BP1 uses to bind chromosomes. But what shifts TIRR away from 53BP1, so the repair protein can work? Researchers clarify the relationship between the repair protein 53BP1, the protein TIRR and RNA molecules released when DNA is damaged. The authors theorized that a type of nucleic acid called RNA was responsible for this shift. To test their theory, they engineered a protein that would bind to the 53BP1 repair protein and the RNA molecules released when DNA is damaged. This effort, plus other work detailed in the paper, provides evidence that their idea was sound. 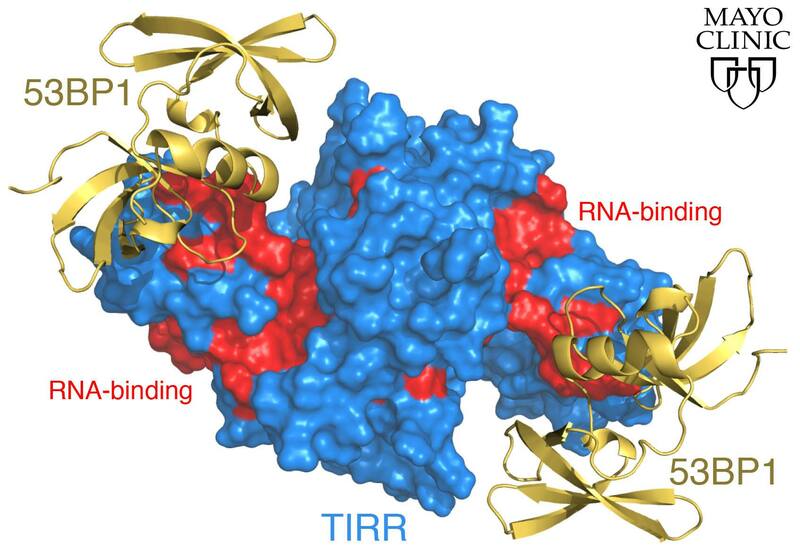 The authors report that when DNA damage occurs, RNA molecules produced at that time can bind to TIRR, displacing it from 53BP1 and allowing 53BP1 to swing into action. Also in the paper, the authors report that displacing TIRR increases sensitivity of cells in cell culture to olaparib, a drug used to treat patients with ovarian cancer. "Unfortunately, over time cancer cells develop resistance to drugs in this category, called 'PARP inhibitors.' Our work provides a new target, TIRR, for developing therapeutics that would help specifically kill ovarian cancer cells," Dr. Mer says. Collaborators on this work include the Dana-Farber Cancer Institute and the Wellcome Trust Centre for Human Genetics at the University of Oxford in the U.K. In addition to Dr. Mer, other Mayo Clinic authors are Maria Victoria Botuyan, Ph.D., Gaofeng Cui, Ph.D., James R. Thompson, Ph.D., Benoît Bragantini, Ph.D., and Debiao Zhao, Ph.D. The authors report no conflict of interest. Funding for this research was provided by the National Institutes of Health, including the Mayo Clinic Ovarian Cancer Specialized Program of Research Excellence, and the U.S. Department of Defense. Additional funding sources are listed in the publication.